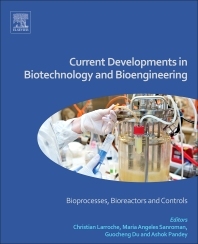 Current Developments in Biotechnology and Bioengineering: Bioprocesses, Bioreactors and Controls provides extensive coverage of new developments, state-of-the-art technologies, and potential future trends, reviewing industrial biotechnology and bioengineering practices that facilitate and enhance the transition of processes from lab to plant scale, which is becoming increasingly important as such transitions continue to grow in frequency. Focusing on industrial bioprocesses, bioreactors for bioprocesses, and controls for bioprocesses, this title reviews industrial practice to identify bottlenecks and propose solutions, highlighting that the optimal control of a bioprocess involves not only maximization of product yield, but also taking into account parameters such as quality assurance and environmental aspects. Professor Christian Larroche is a graduate in Biochemical Engineering from the INSA, Toulouse, (1979), Docteur-Ingénieur in Organic Chemistry from Paul Sabatier Toulouse 3 University (1982), and Docteur ès Sciences (Ph D) in Biochemical Engineering from Blaise Pascal University (1990). He has strong research interest in the area of applied microbiology and biochemical engineering. His skills are related to biochemical engineering, especially the study and development of special processes for the use of microorganisms. This includes fungal spores production by solid state cultivation and their use as protein (enzyme) reservoir in biotransformations. A special interest in phase transfer phenomena coupled to metabolic engineering has to be noticed. It is applied to the design and optimisation of biotransformations involving hydrophobic compounds and carried out in biphasic liquid-liquid media. These processes are related both to the food and environment (bioremediation) areas. His interests have recently be extended to bioenergy, and he is presently co-ordinator of two French research programs on biohydrogen production by non photosynthetic anaerobic microorganisms grown on complex media. He is author of about 170 documents, including 75 articles, two patents, 12 book chapters and 18 co-edition of books or journal special issues. He has supervised 10 PhD students and 20 MSc lab works. He is member of SFGP (French Society for Process Engineering) and vice chairman & administrator of IFIBiop, an international network entitled "International Forum on Industrial Bioprocesses". He is head of the department of "Study and Development of Processes involving Microorganisms" of the platform for technological development Biotechnology – Material Engineering of Blaise Pascal University and belongs to the team GePEB (Process engineering, Energetics and Biosystems) of the Institut Pascal in the same university. He has been vice-president of the university in charge of research valorization and technology transfer (2008-2012) and is currently director of Polytech Clermont-Ferrand, a graduate school of engineering of Blaise Pascal University. Professor M. Angeles Sanroman is a graduate in Chemical Engineering from the University of Santiago de Compostela, Spain (1987). She did her PhD degree in Biotechnology (1991), focusing on development of bioreactor and cell immobilization techniques. She joined the staff at University of Vigo in the Department of Chemical Engineering. She is the Head of the Bioengineering & Sustainable Processes Group at University of Vigo. This is a multidisciplinary research group that joins knowledge and efforts in the development of technologies to be applied in several industrial sectors. Nowadays, the main research lines carried out are Biodegradation of recalcitrant organic compounds, Solid state fermentation, Enzymatic technology, Bioreactors design and Advanced Oxidation Technologies. The results of these research works have been published in more than 220 papers, 5 patents, 18 chapters of books and more than 350 research communications. She has collaborated in more than 50 research and innovation projects at national and international calls and various contracts and actions in relation to the transference of technology to business administration and companies. In this context, her activity as a researcher is remarkable, being director of the Research Results Transfer Office of the University of Vigo, member of ANEP - Spanish Ministry of Economy and Competitiveness in the Chemical Technology Area (2007- 2011) and Technology Transfer Area (2015-now), regular evaluator of research projects in competitive calls for various national and international programs and member of the editorial board of several journals, including Bioresource Technology as Associate Editor. Professor Guocheng Du works in School of Biotechnology, Jiangnan University, China. He is the distinguished professor of Changjiang Scholars, Ministry of Education, China. His current main research focus is on bioprocess engineering and metabolic engineering. He has about 230 publications/communications, which include 60 patents, 8 books, 210 original and review papers, etc. He won two Second Prizes of State Science and Technology Award in 2006 and 2012, respectively. He has been conferred Honorary Doctorate degree from Jiangnan University, China. Professor Guocheng Du is deputy director in the committee of biochemical engineering modelling and control, Chinese Society for Microbiology, and deputy director of Beer Branch, China Alcoholic Drinks Industry Association. He is the associate editors of Journal of the Science of Food and Agriculture and Microbial cell Factories, and the editorial board member of Bioresource Technology.